T-Mobile and Sprint finally agreed to a massive telecom merger after years of negotiations punctuated by two breakups. The agreement would leave just three major wireless carriers in the United States and must clear antitrust regulators. The combined company, which will take on the name T-Mobile, would be positioned as a fierce competitor to Verizon and AT&T. T-Mobile CEO John Legere, who will head the merged company, said on a conference call Sunday that the firm plans to deliver "the highest capacity network in US history." He said the company will hire thousands of people in a bid to create a nationwide network that will position the United States as the leader in providing 5G connectivity. A recent report from research firm Analysys Mason suggests it's China and South Korea, not the United States, that are currently leading 5G development. have reached an agreement to come together to form a new company -- a larger, stronger competitor that will be a force for positive change for all US consumers and businesses! Watch this & click through for details. The move combines the third and fourth largest wireless service providers in the nation. Sprint was valued at $26 billion based on its last closing price, and T-Mobile was last valued at $55 billion. The deal values Sprint near its latest closing share price of $6.50. Andrew Schwartzman, an attorney who specializes in telecommunications and a professor at Georgetown Law, told CNNMoney he expects it will be "difficult" to get regulators to sign off on the merger. Schwartzman noted the deal was blocked because regulators determined that the wireless market could support four major players, and having them compete benefited consumers. "It will be difficult to convince the Justice Department that circumstances have changed so much that it's necessary to go down to three providers," he said. "That's the major hurdle that has to be confronted." The companies expected to have a better shot at the merger under the Trump administration. SoftBank CEO Masayoshi Son met with Trump the month before he took office to talk up an investment in US businesses. 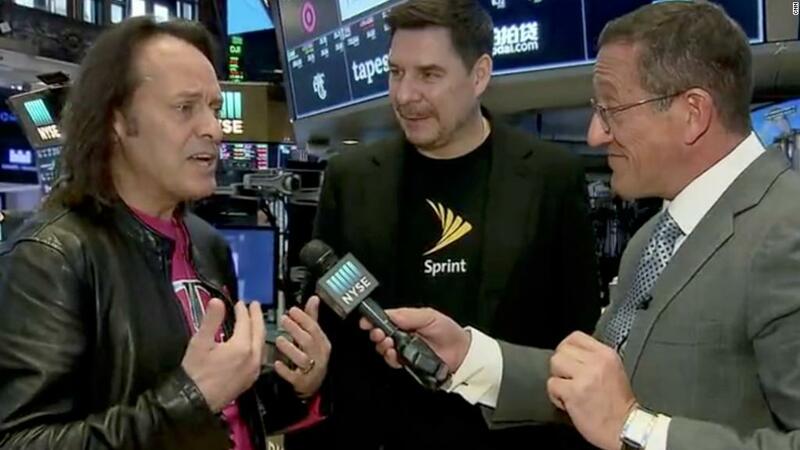 A few weeks later, T-Mobile's Legere said he was open to "various forms of consolidation" when asked about a potential merger with Sprint and SoftBank under the Trump administration. But last November, after much speculation, the two companies issued a statement saying they had "ceased talks." "While we couldn't reach an agreement to combine our companies, we certainly recognize the benefits of scale through a potential combination. However, we have agreed that it is best to move forward on our own," Marcelo Claure, the Sprint CEO, said at the time. Sprint and T-Mobile's announcement is just the latest step in an ongoing movement towards telecom consolidation. AT&T (T) is in talks to acquire Time Warner (TWX), which owns CNN. The outcome of that $85 billion merger-in-the-making depends on a case in federal court, which is pending the decision of the judge.